Finnish avant-garde filmmaker Mox Mäkelä’s film Strange (Vieras) premieres on May 15, 2019 at 18.30–21.00, Tate Modern, London, UK. 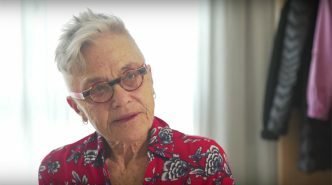 Video (36:05): A lively discussion with Barbara Hammer, an icon of queer cinema, on her relationship to the TEDDY AWARD, living with cancer and her new film ‘”EVIDENTIARY BODIES”. Mimosa House is an independent, non-profit gallery space in the heart of Mayfair curated by Daria Khan. Dedicated to artistic experimentation and collaboration, they support dialogue between intergenerational women and queer artists. The Fourth edition of the Kochi-Muziris Biennale runs until March 29, 2019 in South India. Barbara Hammer died earlier this month (March 16, 2019). She was an amazing pioneer filmmaker and a mentor of generation of younger queer filmmakers. June 1 – August 11, 2019, the Wexner Center for the Arts at The Ohio State University debuts the exhibition, Barbara Hammer: In This Body.